As hardy as it is beautiful, the Pearl Bubble Coral is a beginner's coral and worth every penny! The Octobubble Coral Plerogyra flexuosa, popularly known as the Pearl Coral or Pearl Bubble Coral, is commonly found in the aquarium trade. The Plerogyra genus are known as the 'grape' corals or 'bladder' corals. In the wild, they form flat round colony clusters, looking much like clusters of grapes. They come in branching varieties as well. Their 'grapes' are water filled vesicles (bubbles) that will actually inflate or deflate, depending on the light available. The bubble shaped vesicles can be round and smooth, like those on the Bubble Coral Plerogyra sinuosa, or the can have little tips on the ends like the Octobubble Coral. The Octobubble was once thought to be a morph of the Bubble Coral, but it has been determined that it is in fact, its own individual species. The sheen over its tissue, and the little "tips" on its bubbles sets it apart. All the Grape Corals have lightweight skeletons consisting of short thick stalks topped with corallites. This skeleton is hidden by the oval water filled bubbles. These bubbles only come out during the day. At night they retract, making way for their tapered feeding tentacles to emerge and gather prey. Be cautious, while the bubbles do not have toxins, these feeding tentacles are capable of delivering a sting. The P. flexuosa is easy to care for and comes in shades of bluish green to green, cream, and tan. It may be a little easier to care for than its close cousin the Bubble Coral since its "bubbles" are just a little smaller, resulting in less of a risk of tearing the tissue on their skeleton. The Pearl Corals are quite content with low lighting, gentle currents, and being careful to not damage their tissue. They enjoy, but do not require, bright light. To be kept under stronger lighting, they will need to be acclimated over a period of time. These guys, like their fellow "bubble corals" are hungry and need to be fed daily for best results. Distribution / Background Plerogyra Coral Information: The Plerogyra genus was described by Edwards and Haime in 1848. There are 6 nominal and 3 true species, but the two species that are most familiar are the Bubble Coral P. sinuosa and the Octobubble Coral P. flexuosa. Names these corals are known for are Grape Coral, Octobubble Coral, Bladder Coral, Pearl Coral, and Branching Bubble Coral. Some common names this species are known for are Pearl Coral, Pearl Bubble Coral, Cat's-eye Bubble Coral, and Octocoral. They have been propagated in captivity. Where Plerogyra Corals Are Found: The Plerogyra genus are found in the Red Sea, Indian Ocean, and the west Pacific Ocean from the East China Sea all the way to the west, north, and east coasts of Australia, then east toward the Line Islands. P. flexuosa is found in the Red Sea, then south along Africa's east coast, ending 1/2 way down the continent, then heads eastward, around Madagascar and the Mauritius Islands. They continue east to the top of Australia's northern coast, including the Great Barrier Reef, Coral Sea and Ningaloo Reef. From there, they continue east and are found from New Caledonia to Samoa. From Samoa, their habitat curves back north west to the Marshall Islands, Guam, and the Ryukyu Islands. Continuing back westward, they are found around Taiwan, Vietnam, the Philippines, Indonesia, and then back to Maldives, where they finally make a full circuit back to where we started, the Red Sea. Plerogyra Coral Habitat: The Plerogyra genus are found in gentle water movement on lower reef slopes, inhabiting caves or crevices, and under overhangs. They seem to have no real light preference. They can be found in low light areas that have almost total shade or in shallower brighter waters, yet all habitats have turbid waters. Since P. flexuosa is now recognized as a different species, rather than one of the morphs of P. sinuosa, it is possible that P. flexuosa shares its status on the IUCN Red List of Endangered Species as Near Threatened (NT). Description What do Plerogyra Corals look like: Both the Bubble Coral P. sinuosa and the Octobubble Coral P. flexuosa come in one colony with large water filled "bubbles". This is a display that is easily recognizable. The "octobubble" term comes from the bubbles on the Octobubble Coral P. flexuosa, being "nippled" at the tip. The Branching Bubble Coral P. simplex has a similar look as P. sinuosa, except it has individual branches. These little groupings barely touch each other and are separated with quite a bit of space within the colony. P. discus looks almost identical to the Fox Coral Nemenzophyllia turbida, with the same flowery look, but each puffy vesicle is connected to a separate branch. The Plerogyra genus, whether branching or not, has a typical lightweight skeletal structure that is easy to cut or sever. They have oval water filled vesicles (bubbles). The bubbles are not polyps, but modified tentacles which protect the delicate polyps beneath them. The bubbles will expand or contract as needed for acquiring more or less light during the day, but at night they deflate. Then 3 - 4" (7.5 to 10 cm) feeder tentacles, which CAN sting, emerge looking for food. Though similar to P. sinuosa, the bubbles on the Octobubble Coral tend to be a little smaller and greater in number. They both have oval water filled bubbles, but those of P. flexuosa tend towards elongated tips. These tips are not to be confused with the long stinging sweeper tentacles. There are also small short tentacles sometimes seen with the bubbles during the day, and these also do not sting. P. flexuosa comes in shades of ivory, cream or green, blue or tan, with a more pearled sheen to it, but will turn brown if the light is too high. There are usually pieces of sharp, delicate, thin "bone" called septa in-between the bubbles. The tissue of the Plerogyra genus will actually connect and encrust onto nearby substrate. Some colonies can reach 3 feet (1 m) in the wild, but most are smaller, only getting to around 7.5" (19 cm). Their lifespan is unknown. 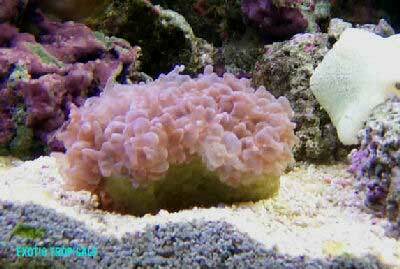 Difficulty of Care Plerogyra Coral Care: The P. flexuosa can be moderate to easy to care for. The "bubbles" tend to tear easier with this genus, compared to the smaller bubbles of the Physogyra genus. Provide gentle water movement and low to moderate light, and this is an easy LPS with few demands. When choosing your new charge, make sure the LFS employee gently shakes the coral until most of the bubbles deflate and recede. Removing it to air while inflated will cause tears in the flesh, leading to infection. Even if the coral is left submerged, the septa can cut into the bubbles against the bag it is being put into. Also, make sure there is no algae on the septa once it is visible. Foods / Feeding Plerogyra Coral Feeding: The Plerogyra corals are considered planktivores and have developed several feeding strategies. Through a symbiotic relationship with a marine algae, known as zooxanthellae, they receive many of their nutrients. They also capture planktonic organisms, food particles from the water column, and can absorb dissolved organic matter. In captivity, feed when the feeder tentacles are out in the evening with mysis, rotifers, enriched brine shrimp, Cyclopeeze and other similar sized meaty foods. Try to not feed large pieces since it makes it difficult for the animal to digest such foods and often results in them regurgitating late at night. When this happens, they are not benefiting from the feeding and it can lead to eventual starvation. A well-feed live rock/reef environment is what is needed for your Octobubble Coral, along with some fish for organic matter production. A mature tank is recommended. Provide gentle water movement and low to moderate light. They enjoy, but do not require, bright light. They are fairly hardy but are more easily injured than other LPS coral species like the Elegance coral. They can actually increase and decrease their bubble size if they need more light, yet can be stressed and die if exposed to bright light right away. There are usually pieces of sharp, delicate, thin "bone" called septa in-between the bubbles, so care needs to be taken to prevent the bubbles from getting "popped" on this skeleton. Compatibility and Social Behaviors Plerogyra corals can be aggressive if touching other corals and should be positioned away from all other corals. It needs to be at least 6" away since it sends out sweeper tentacles at night. Their sweeper tentacles can punch a powerful sting to other corals as well as humans. Leather corals emit a toxin that will harm them. They have been known to die in the presence of a large leather coral population (Sinularia). The Plerogyra genus also does not like hermit crabs, as they irritate its flesh. Breeding and Reproduction The large polyp stony (LPS) corals are male and female and can reproduce both sexually and asexually. In the wild they reproduce sexually by releasing eggs and sperm at the same time, resulting in a fertilized egg which then forms into a free-swimming planula larva. Eventually the planula larvae settles onto the substrate, becoming plankters. This then forms a tiny polyp which begins to excrete calcium carbonate and develops into a coral. Planula larvae are extremely vulnerable to predation, and very few survive. Plerogyras reproduce asexually as well. The tissue of the Plerogyra genus will actually connect and encrust onto nearby substrate and they tend to grow in a vertical orientation. At times, this results in a new "bud" and will start to form a new colony. Physical propagation should only be attempted on branching varieties. It needs to be left up to the encrusting behavior of this coral to propagate it. Cutting into the tissue will result in damage that can lead to disease. It is best to feed them well and keep them happy, then they will form buds which can be harvested and produce quite a few colonies a year! Just be patient. The larger your coral gets, the more "babies" it will give you. If algae starts to grow on its septa, gently scrub it away, since the coral will not be able to recover on its own. An electric rotary tool can be used on particularly stubborn algae. Tissue damage and shock will occur if placed under direct Metal Halides or other bright lights. Availability Plerogyra Corals for Sale: The Pearl Coral or Octobubble CoralP. flexuosa is very easy to find at pet shops and on line. Online they can run about $50.00 USD or more depending on size and/or color.